Viewing the results offered the script made ​​by Chris Granados (http://xiancg.com/wp/2010/12/script-for-maya-based-upon-worn-edges-from-neil-blevins/) realized version Blender. In our world the edges are more exposed to wear than smooth surfaces, usually, and that causes them to break down more quickly. You made my teeth dry. Prevoiusly I was trying to get it with AO, but was never satisfied. Hope it makes into trunk. very nice, you should add your new ones to contrib. Hi !!! thanks a bunch! The addOn is in contribs now. What!! That’s great! 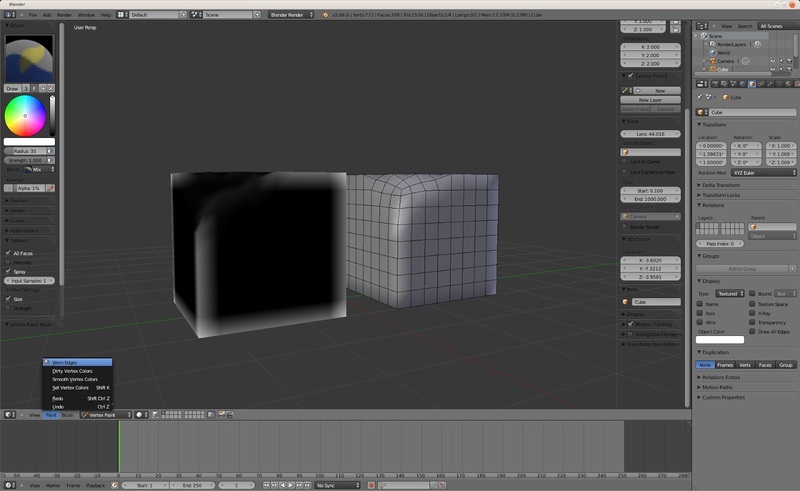 Will have to brush up on my material nodes… would be neat for creating glossy edges on ice I think too. Critch, Shift + R repeat the last operator, in this case “Dirt Map”. Cool. is this based on Dirty Vertex Color? If so would be great to have Blur option. This addOn is not Based in other tool, but is similar. Blur is a good idea! THIS AWESOME!!! There’s a similar plug-in like this for Maya! Just wanted to say “Thanks!”. Simple, yet effective :). How do I enable this? I cant seem to find it in addons. The easy way… ctrl alt U… addons… install… search .py in the folder. You da’ man, oscurart! Thanks! I could literally hug you right now. I’ve been trying my damnedest to do this with xnormal and high to low polygon map burning, but with mixed results. Thank you. Is there a way to bake this vertexmap to a texture? If so, what are the steps?